From the G-Chrono collection, this handsome and masculine bracelet watch is crafted in robust stainless steel for a sleek finish, and features a bold black chronograph dial with silver tone indices and logo branding. Also offering a case styled in the iconic 'G' shape, this eye-catching piece is perfect for his day to night look. 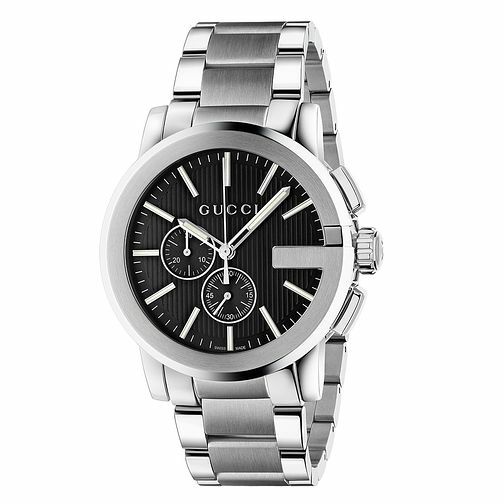 Gucci G-Chrono stainless steel bracelet watch is rated 5.0 out of 5 by 1. Rated 5 out of 5 by Anonymous from Fantastic Bought as a gift, was so pleased with the high quality of the watch. Really well made, couldn't be happier with the design and quality. Beautifully presented in an immaculate box. Can't wait to give it to him! !